Prior to its official release, we were given the opportunity to get hands-on with the Canon EOS M10 - the company's latest compact system camera aimed at novices and beginners. Michael Topham reveals the new features and offers his first impressions. As well as introducing two new models into its GX-series in the from of the Canon PowerShot G5 X and Canon PowerShot G9 X, Canon has unveiled its latest member to join the EOS M lineup – the EOS M10. Sitting just below the more advanced EOS M3 that was announced earlier this year, the EOS M10 is designed to be the direct successor for the EOS M – a camera that will long be remembered for being the manufacturer’s first endeavor into the world of mirrorless. Out to target beginners in search of their first compact system camera, the EOS M10 carries on where the EOS M left off by featuring an 18-million-pixel sensor, which is now teamed up alongside Canon’s latest DIGIC 6 image processor. As well as sharing the same pixel count as its predecessor and many of the manufacturer’s beginner EOS models, it continues to offer an ISO range of 100-12,800 that’s expandable to an ISO equivalent of 25,600. When we reviewed the original EOS M three years ago we were rather underwhelmed by its slow and unresponsive autofocus system – something Canon has looked to address on the EOS M10 by introducing a 49-point Hybrid CMOS AF II autofocus system. 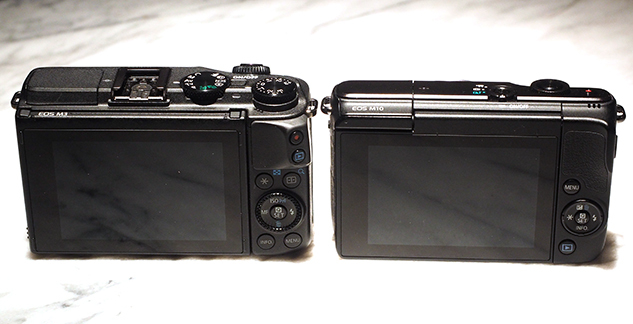 Although not the same as the Hybrid CMOS AF III system as used within the EOS M3, it’s claimed to be 2.4x faster than the original EOS M.
The other main area of advancement is found at the rear where a tilting 3-inch, 1,040,00-dot tilting touchscreen replaces the fixed touchscreen of old. Tilting the screen by 180 degrees automatically initiates a self-portrait mode to undertake high-quality selfies. Elsewhere, the EOS M10 can shoot continuously at up to 4.6fps, Full HD video (1920×1080) is recorded at 30,25 and 24fps, and the ergonomically situated front dial provides instant access to advanced settings such as aperture and shutter speed. In conjunction with the launch of the EOS M10, Canon has also developed a new kit lens that’s significantly smaller and lighter than the older Canon 18-55mm f3.5-5.6 STM IS. 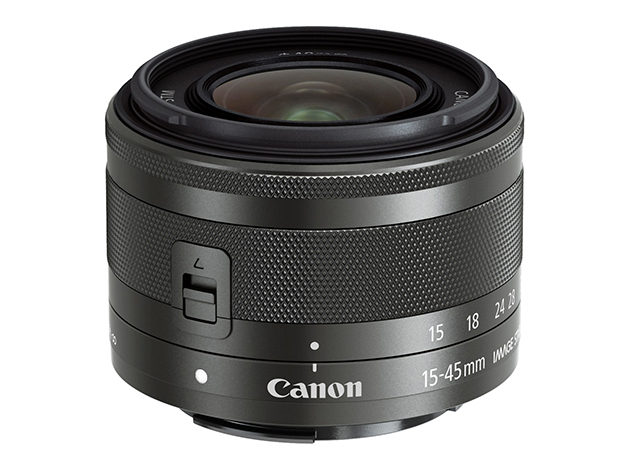 The EF-M 15-45mm f/3.5-6.3 IS STM offers a focal length that’s equivalent to 24-72mm in 35mm terms and its collapsible design helps to keep it as compact as possible when not in use. Weighing just 130g, this travel-friendly lens includes a 3.5-stop optical image stabilser and employs Canon’s tried and tested STM technology to ensure a smooth and near silent focusing performance. 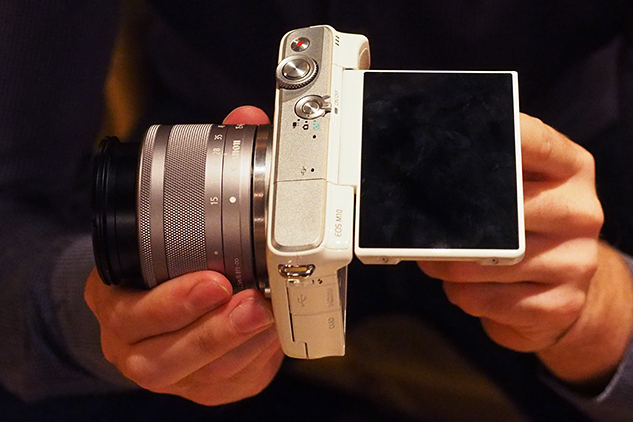 It’ll come finished in two colours – silver and graphite, with the former being sold with the white version of the EOS M10 and the latter with the black. 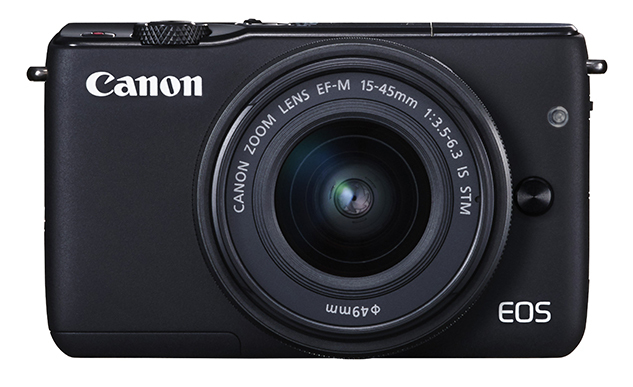 Available in November, the EOS M10 will be priced at £399 with the new 15-45mm kit lens. For those tempted to upgrade from the original EOS M or simply want to buy the camera body only, it’ll also be available for £304. When you start to compare the EOS M10 alongside the EOS M you’ll notice the design has been simplified slightly. On the top-plate for example, Canon has decided to do away with the hotshoe – a feature that than can be found on the more advanced EOS M3. The top plate also goes without a large mode dial and exposure compensation dial. More advanced photographers looking for more manual controls across the body will want to look at the EOS M3 ahead of the EOS M10. Turning to the rear, things are simplified here too. The scroll wheel is replaced by a basic d-pad with a playback button beneath and a menu button above. The movie record button that was positioned on the corner of the body on the original EOS M has been relocated to the top-plate and a switch that incorporates the on/off button within replaces the mode dial, offering access to the camera’s automatic, stills and video modes. The design is more in keeping with what beginners and those purchasing their first compact system camera will want and pairing the camera with the new 15-45mm kit lens revealed it’s smaller to carry around than the EOS M or EOS M3 with the larger Canon 18-55mm f3.5-5.6 STM IS kit lens attached. 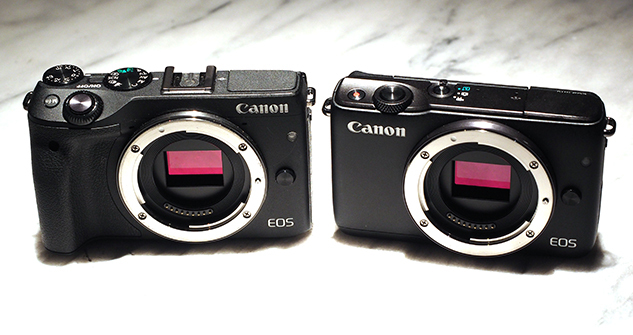 There’s never been much to fault with regard to the build quality of Canon’s EOS M models. Though the white version feels a bit more plasticky in the hand compared to the black, the fit and finish is of a high standard for a camera that costs less than £400. 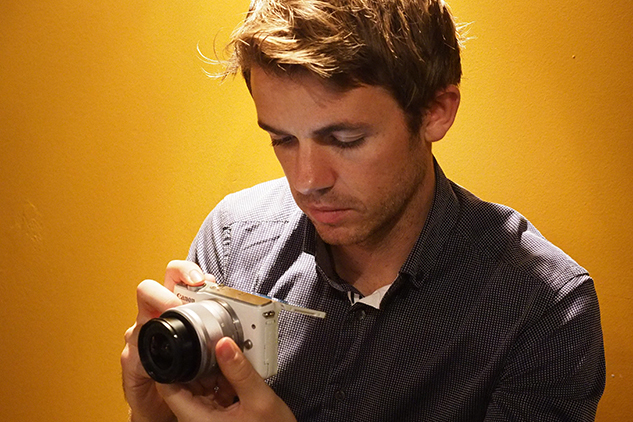 During our hands-on session we gave the autofocus a try in a low-light scene. While it managed to lock on noticeably faster than the original EOS M, there were still a few occasions where it struggled to find focus. It’ll be interesting to find out how the autofocus system performs in more favourable conditions outdoors when our review sample arrives in the next few weeks. Canon were fairly late to join the compact system camera market, but the release of the EOS M3 and now the EOS M10 suggests that the manufacturer is focusing its efforts to create EOS M models to meet different photographer’s abilities and needs. The launch price puts it up against some stiff competition in the market and as things stand it’s slightly cheaper than the Sony Alpha 5100 and Olympus Pen E-PL7. Both the Fujifilm X-A2 and Panasonic Lumix DMC-GF7 are slightly cheaper alternatives to the EOS M10.